After disappearing for three days, a 4-year-old orange tabby cat found his way back to his owner — but his human was horrified to discover a 13-inch arrow embedded in the feline’s head. Fortunately for Brownie, the shaft only pierced the feline’s muscle and the cat made a full recovery. Despite a hefty reward, the assailant was never found. A dog who suffered from neglect was covered in so much matted hair (2 pounds to be exact) shelter personnel couldn’t tell if the animal was a boy or a girl. After a lengthy, and at times painful, grooming session, an energetic, friendly pooch was revealed. She was named Ellen. Eldad and Audrey Hagar (of Hope for Paws) are renowned for rehabilitating abandoned dogs from the streets of Los Angeles, but they met their match in Fiona, a Poodle mix covered in matted fur, blind, and suffering from the worst flea infestation they’d ever encountered. Thanks to eye surgery, the pooch regained partial vision and was adopted into a home with three other dogs. 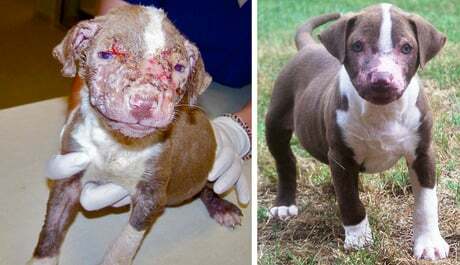 A 6-week-old Pit Bull mix puppy with acid burns on his face, feet, and belly was taken to a South Carolina shelter. For weeks, personnel helped the pooch fight off infection. After months on the mend, Freddy was adopted. A 3-month-old kitten, who had his front legs shattered by a human wielding a golf club, made a full recovery — thanks to generous donations and the dedicated staff at the Barnes Mill Animal Hospital in Richmond, Kentucky. Some countries have very limited resources available to care for injured animals. So when a 2-year-old tabby cat with shrapnel lodged near her left eye was found dragging her hind legs through the streets of Tehran, his days — no, hours — seemed numbered. An Iranian animal-rights group saved the cat and tried to restore his mobility (the deformed back legs were the result of birth defects), but were forced to amputate one of the limbs due to an infection. Maloos was sent to San Francisco where he was adopted by a woman who, ironically, fled Iran in the wake of the 1979 revolution. On March 26, 2011, a starving, abused Pit Bull was found in the garbage bin of a 22-story apartment building. The 19-pound pooch was skin and bones, but thanks to 24-hour care, and a blood transfusion, he recovered. The pooch was named Patrick after the annual St. Patrick’s Day holiday. In Quebec, a 10-year-old Shih Tzu nicknamed Rasta, was covered in so much matted hair that one person thought the homeless animal was a pile of trash. After a 3-hour grooming session involving six humans, the dog was cleaned up. After a stay in a vet clinic and a foster residence, Rasta found a forever home. 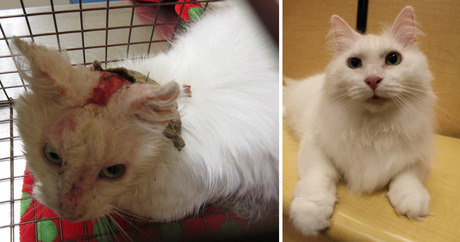 A Michigan couple who captured a stray white cat were horrified to discover the feline was the victim of horrific abuse — namely, acid burns on her neck. Considering Snow was also FIV-positive, which leads to a weakened immune system, it’s remarkable she recovered. A weeks-old kitten, who was rescued from a suspected hoarding situation in Chicago, suffered from a condition where his legs were crisscrossed and backwards, forming a “W.” The only way for the feline to move was to drag his legs behind him, creating sores on the limbs that would be vulnerable to infection. After a successful surgery, Stockings can now walk — but more important, he was adopted and found a forever home.